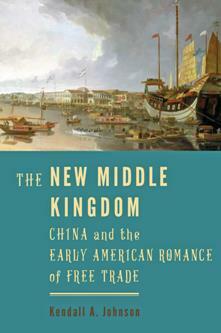 In the imaginations of early Americans, the Middle Kingdom was the wealthiest empire in the world. Its geographical distance did not deter commercial aspirations-rather, it inspired them. Starting in the late eighteenth century, merchants from New York, Philadelphia, Boston, Salem, Newport, and elsewhere cast speculative lines to China. The resulting fortunes shaped the cultural foundation of the early republic and funded westward frontier expansion. In The New Middle Kingdom, Kendall A. Johnson argues that-for the merchant princes who speculated in the global Far East, as well as the missionaries and diplomats who followed them-Manifest Destiny spurred more than the coalescence of the fractious regions into the continental Far West. It also promised a golden gateway to the Pacific Ocean through which the nation would realize its historical destiny as the world's new Middle Kingdom of commerce. Examining the influential accounts of westerners at the center of early US cultural development abroad, Johnson conceives a romance of free trade with China as a quest narrative of national accomplishment in a global marketplace. Drawing from a richly descriptive cross-cultural archive, the book presents key moments in early relations among the twenty-first century's superpowers through memoirs, biographies, epistolary journals, magazines, book reviews, fiction and poetry by Melville, Twain, Whitman, and others, travel narratives, and treaties, as well as maps and engraved illustrations. Paying close attention to figurative language, generic forms, and the social dynamics of print cultural production and circulation, Johnson shows how authors, editors, and printers appealed to multiple overlapping audiences in China, in the United States, and throughout the world. Spanning a full century, from the post-Revolutionary War era to the Gilded Age, The New Middle Kingdom is a vivid look at the Far East through Western eyes, one that highlights the importance of China in antebellum US culture.